The game was played in front of a disappointing crowd of 1655, which was the lowest crowd at Tannadice for a competitive fixture since 1974. 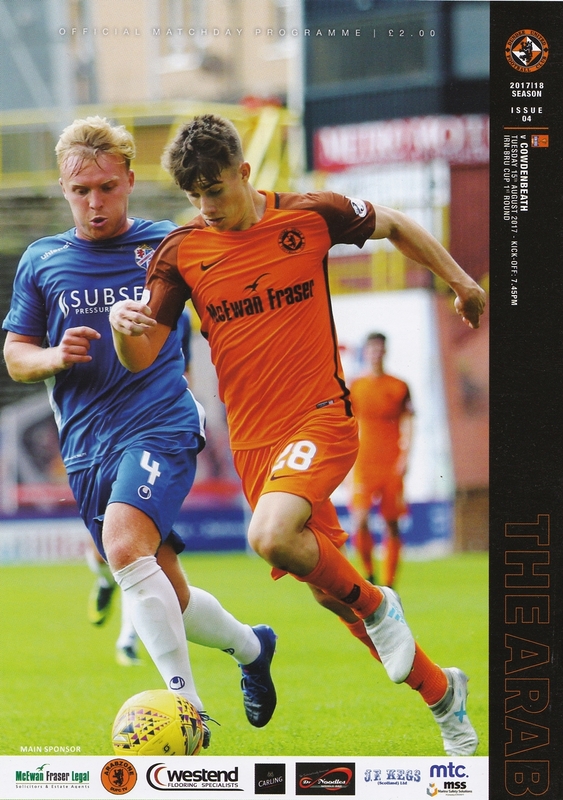 The low crowd and the rather makeshift nature of the side probably contributed to a rather sluggish start for United, with their League Two opponents making a better start to the game than their more illustrious opponents. Their first chance was after only four minutes, with United being rather fortunate not to find themselves a goal behind as Ryan Connelly hit the inside of the post with Deniz Mehmet beaten, from which the ball was hastily cleared for a corner. United themselves had an opportunity with a good cross from Graham Taylor, but his low cross was cleared by the away defence, before a speculative effort from James Keatings was deflected wide. After 20 minutes, Mehmet was forced to make a fine save from a Robbie Buchanan shot after the Cowdenbeath player cut in from the right. From the resultant corner kick, the ball reached Jamie Pyper at the back post, who probably should have scored. However, he knocked the ball just wide of the gaping goal. 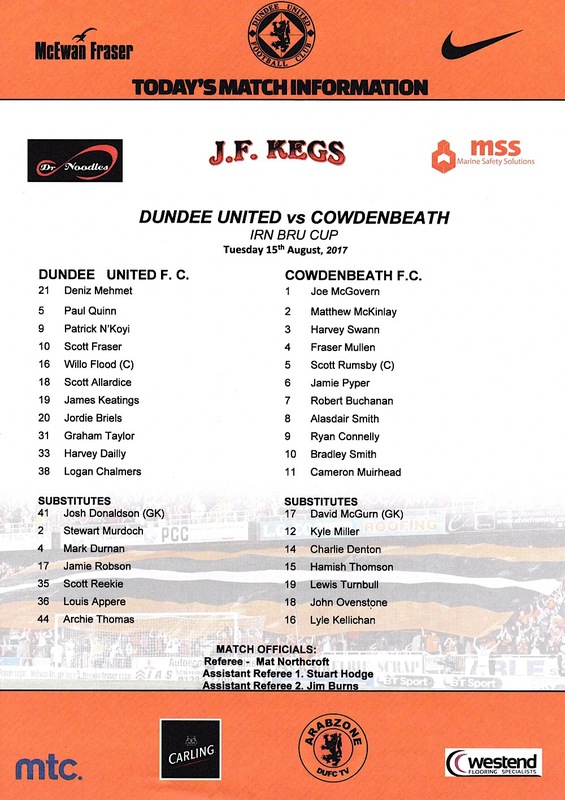 After half an hour, United created a good chance when a Scott Fraser took a quick free kick to James Keatings, who took a shot which was well saved by the feet of Cowdenbeath keeper and former United player Joe McGovern. The away keeper also did well to smother a further shot from Keatings on the rebound. 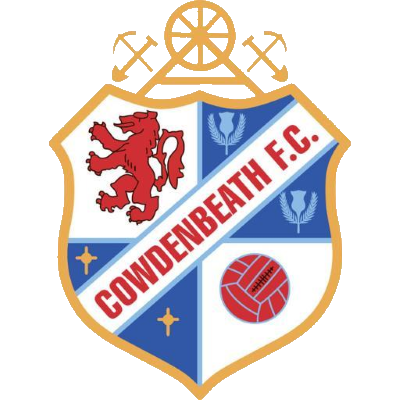 The next chance, which proved to be the final chance of a rather turgid first half came five minutes later and was again for Cowdenbeath, as Alasdair Smith fired a fierce effort just off target from 25 yards. 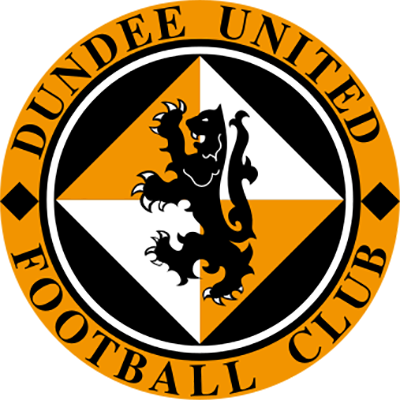 The first chance of the second half came for Dundee United, and it came from another Scott Fraser free kick, this time won by a foul on Graham Taylor. Fraser played the ball into the box where the ball was met by a header from Patrick N’Koyi, which McGovern did well to save low to his left. A couple of minutes after that, with McGovern again being forced into action, this time by making a save from James Keatings, who had been played through by an excellent pass from Scott Allardice. Soon after wards, Taylor almost crowned his first start with a goal, but his volleyed effort from 12 yards out was just wide. United finally got the goal their second half pressure merited after 61 minutes. Fraser played a one-two with Willo Flood in midfield and then made a great run into the box. He squared the ball to Patrick N’Koyi, who smashed the ball past McGovern from six yards out for his first goal for the club. The lead was doubled by the same player six minutes later. Keating send a wonderful cross into the box where N’Koyi was waiting, and he planted a superb header into the bottom corner of the net, which despite his best efforts, McGovern was unable to keep out. United were finally starting to dominate the game, and nearly scored a third goal after 70 minutes. Taylor picked up the ball on the United right and passed the ball to Keatings, who curled a shot off the crossbar from 20 yards out. In the end, United were content to see the game out and sit on their 2-0 win. There were a couple of late half chances for Fraser and late substitute Louis Appere, but there were no further goals and United coasted into the next round. Although United could and maybe should have won the game by more, they were content with a comfortable 2-0 win.